Because of a Horse–now available! Go here to purchase Because of a Horse on Amazon! Thank you all for your support! 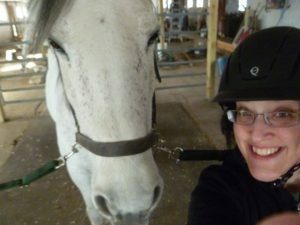 Because of a Horse was so much fun to write! 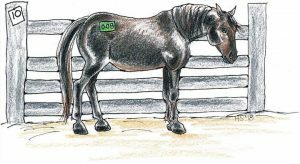 Fortunato Cavallo’s Carol Ann, “Cricket,” had a rough start to her life. Forgotten and scared–she was rescued at the 11th hour, and was given warmth, safety, and love in time for Christmas. She went on to become a little girl’s adored pony–and a dressage champion at the Randy May Memorial dressage schooling show! She is an amazing pony, and is loved by so many. And now, “#009,” a poem inspired by the brave and beautiful Cricket: We love you, dear Wonder Pony! love wins! The pony with no name is #009. Surrounded by love and pretty things. Is she still there, the pretty #009? My dear and brave #009. My gentle and adored #009. My best wishes to you for a wonderful new year filled with love and laughter. Hello everyone! Happy Fourth of July! In the interview, I mention my final book in The Great Red Horse trilogy–The Great Red Horse: The Legacy– and I would like to share more of an update with you on my blog. The book is written (yay! ), most of the illustrations are outlined(yay! )–I just need to break out the watercolors and the brushes and get to work. Not much is happening with that right now because Connecticut is in the middle of an epic heat wave, and my studio doesn’t have air conditioning (!). So, I am waiting (somewhat impatiently!) for fall to arrive. I am not much of a summer person, and my friends will tell you how much I complain during the dog days. Grumpy Cat becomes my spirit animal in the summer, I won’t shut up about the heat and general grossness until glorious October! But, I like fireflies. And watermelon and fresh corn. 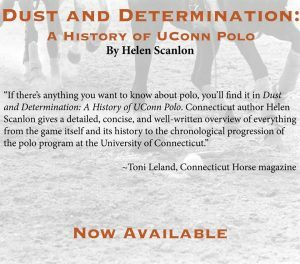 Dust and Determination: A History of UConn Polo was SO MUCH FUN to write–I am happy that readers think it’s fun to read as well. Thank you! If there’s anything you want to know about polo, you’ll find it in Dust and Determination: A History of UConn Polo. 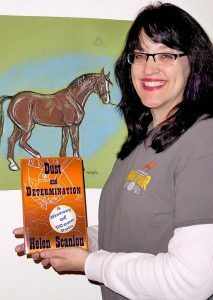 Connecticut author Helen Scanlon gives a detailed, concise, and well-written overview of everything from the game itself and its history to the chronological progression of the polo program at the University of Connecticut (UConn). Helen’s enthusiasm and description of her first encounter with polo leaves one with the urge to go see a game…Throughout this nice volume, Helen’s beautiful artwork enhances her writing, and some chapters include historical photographs of UConn’s program and players. If you loved reading this book as much as I enjoyed writing it–feel free to write a review! Authors, especially those who are independently published (like yours truly), love it when our readers spread the word about our work. It means a lot to us! So, share the love. Dust and Determination: A History of UConn Polo is HERE! Happy New Year, and I hope your holidays were filled with laughter, good friends, loved ones, and good eats! 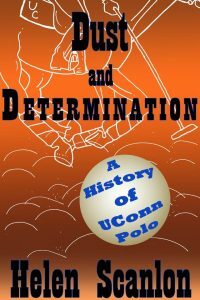 My fourth book, Dust and Determination: A History of UConn Polo has been published is available on Amazon: buy here! And it already has its first review–five big stars! One reader felt compelled to email me to tell me she couldn’t put my book down even though it was getting late and she should probably get some shut-eye. Another reader wrote that she fully expected a book full of boring sports statistics but found herself on the edge of her chair, hanging on each word. Well, the Huskies have an incredible story–it’s why I was compelled to write this book. My aim is to put my readers in the saddle, mallet in hand. Writing is a solitary business, so when I release my work to the world and get love in return–it’s really quite heartwarming. Thank you, kind readers. Dust and Determination was a blast to write, I am so happy it shows. I must admit, I didn’t expect to love sports writing as much as I did. The history of UConn polo is a tale of fierce competition, unwavering perseverance, drive, guts, and friendship. 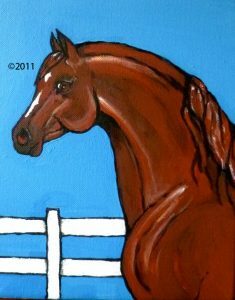 And, of course, a love of one of the planet’s most noble creatures: the horse. The horse is the reason for all of it. I hope to have a book signing or two when the weather warms up a bit, watch this space. The Lady Huskies Overcome Many Hurdles to win the 1997 National Intercollegiate Polo Championship title–an excerpt from Dust and Determination: A History of UConn Polo by Helen Scanlon. COMING SOON! The Lady Huskies were selected as a wild card team in the final four, just like the previous year. 1997 was looking and feeling a lot like 1996, but with some imposing speed bumps: Kim Morgan, the national championship player and animal science major from Springfield, Massachusetts, now a junior, was involved in an automobile accident early in the season, and her recovery time kept her out of the action for an entire month. Then, Meg Dinger’s shoulder injury added another dent to the team’s armor. And, since these things tend to travel in threes, Alicia Wells, also a junior and an experienced national championship player from Sykesville, Maryland, became ill with a nasty bout of the flu a mere three weeks before the national tournament. With plenty of rest and recuperation, Wells, a renewable natural resources major, bounced back like the champion she was and got right back in the saddle for some serious practice time a week before the team was nationals-bound. The universe was testing the young women from UConn, but every obstacle and attempted derailment fed the fire and made them even stronger. Dinger and Wells were not at full capacity when they headed to the Brushy Creek Polo Club in Burleson, Texas for the 1997 National Intercollegiate Polo Championships. Dinger’s shoulder was not completely healed despite months of rest and physical therapy—which further demonstrated how serious her injury was. Wells still felt the remnants of the flu that had left her bed-ridden only two weeks ago. No matter—illness and injury would not stop this runaway train: Dinger and Wells were tough, battle-scarred warriors ready to push through and bring the silver home again. Combine that high-octane tenacity with Kim Morgan completely healed from her injuries, and with the highly athletic and fiercely competitive Jen Freed at full-strength—you had something to make the opposing teams jittery. Jittery was right. All that experience, razor-sharp discipline, unwavering commitment and ruthless work ethic came together to form a polo team that left spectators and opponents awestruck. The Lady Huskies began their final-four onslaught by taking down the highly talented South East Regional Champions, the University of Virginia in the semifinals, at 19-10. In the other semifinal corner, Cornell was busy wreaking their own havoc by obliterating the fierce Stanford University team. The victories had UConn face-to-face with Cornell yet again. In the first chukker, UConn scored five comet-quick goals to get the crowd gaping in amazement and hooting with excitement. The Cornell team rolled their spurs to get in two goals, but it wasn’t good enough to get them a lead by the first chukker. When Cornell had trouble with their ponies in the second and the third chukkers, UConn showed no mercy and claimed a six-point lead. For the final chukker, it seemed that Big Red resolved the pony issues and came alive, scoring five points. Not to be strong-armed, the Huskies, fueled by white-hot adrenaline, mirrored their rivals and claimed five more goals of their own. So, now we know how this story ends. 17-11 flashed on the scoreboard at the sound of the buzzer, and it was done. The crowd erupted. UConn had done it again. The wild card women had defeated not only their longtime rival Cornell—but they had also defeated injury and illness to claim the top prize. Figure, the original Morgan, was a prodigious stallion, passing on his sturdy conformation, stamina and handsome looks to his progeny. In 1942, Figure seemed to be born again in a colt by the stallion Goldfield out of the mare Fairytop. Mentor, bred by the Government Farm, arrived at UConn in 1951 when the Government herd was dispersed. In addition to Mentor, UConn was given the mares Penny, Pennsy, Quotation and Sheba. Mentor was a bit of a sensation when he arrived at UConn. He was a three-time National Champion and was considered by many horsemen of the time as possessing the “best form towards Morgan type in the world today.” He was touted as “the last hope of the Morgans,” to pass on his strength, brilliance and near-perfect classic Morgan conformation to the UConn herd and beyond. 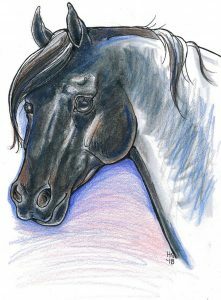 Mentor was a stunning equine specimen: his neck was thick with a clean throatlatch, his shoulder was sloping and powerful and his legs were sound and strong as steel. Highly intelligent, well-mannered and stately with a rich, dark chestnut coat, Mentor sired many foals during his time at UConn, including Quakerlady, Riviera, UC Highlife and UC Senator. Mentor left UConn in 1962 when he was sold to Mr. William Glenney of Coventry, Connecticut. Mentor remained gentle and kind in his golden years, and could sometimes be seen giving toboggan rides to delighted children across snow-covered fields. William Glenney loved his horse and provided the Champion with a comfortable retirement. Mentor breathed his last at age 27. The stallion’s body forever rests in that quiet, verdant land, less than twenty minutes away from the University where he left his proud hoofprints. It is a rare and beautiful thing when research leads directly to the people who were touched by these Morgan horses of long ago. Intrigued, I asked the author of the e-mail to tell me more. Much to my delight, I received a response almost immediately. The memories, including a scan of a faded black-and-white photo of UC Conquistador, filled my e-mail inbox. The Morgans of UConn are so much more than the herd stallions and the broodmares. They are the foals that grow up to be Champions, teachers, partners and best friends. They are the horses that can elicit the joy of younger days, trotting in a dusty show ring under a summer sun, and walking out with a ribbon clipped to the bridle. There are trunkfuls of those ribbons, somewhere, each one holding a proud memory of that special horse: the UConn-bred Morgan.